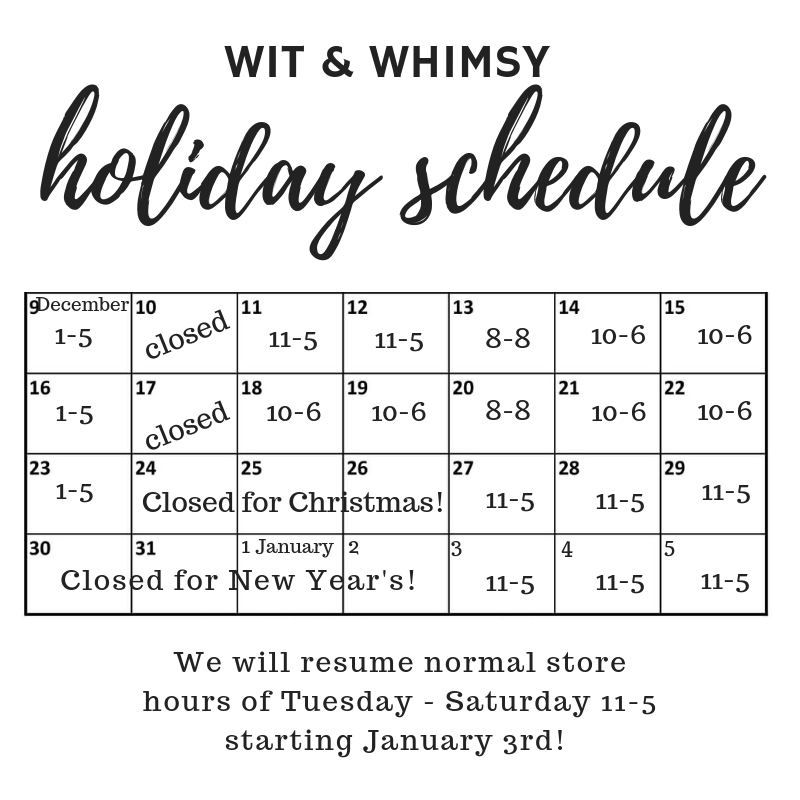 Ways Wit & Whimsy is Trying to Make Your Holiday a Little Merrier! Wit & Whimsy Ways Wit & Whimsy is Trying to Make Your Holiday a Little Merrier! Tuesday, December 18th is the last day to place online orders for standard shipping--but it's on us until then! Use promo code: SHIPSHIPHOORAY for FREE standard shipping! We will continue to offer complimentary gift wrapping-just let us know! Just a reminder, you can create a wishlist here by December 15th to be entered for the $50 gift certificate! I'm sure you're still being asked what you want for Christmas--we've upgraded our gift registry to make it even easier for you! Simply fill out a little info then adding items to your list is as easy as the click of a button! And they will LOVE you for filling one our and making holiday shopping easier on them...bonus, you'll get what you really want! All gift returns/exchanges will have an extension through January 30th for your convenience! Gift certificates are available here! They will be sent to your email so you can forward or print and wrap up to put under the tree! If you see a great gift on Instagram or Facebook just comment or give us a call and we will hold it or have it wrapped and ready for you to pick up ASAP! AND, we just received some great new arrivals that make great gifts...especially a great gift to yourself :) Get the first look at new arrivals at tomorrow's extended hours event from 8am-8pm! Join us for coffee, cookies, and cocoa plus suprise discounts only available in-store tomorrow December 13th! PS- I'll be popping on Facebook live several times over the next few days to talk about my favorite gift ideas and picture perfect pieces to wear around the tree! Follow along here! See you there!